Before WipEout, there was F-Zero. 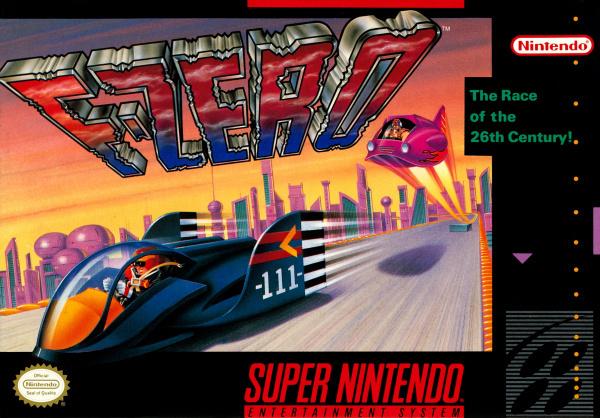 Nintendo's futuristic racer was one of the first SNES releases, but shows very little sign of aging — in fact, it feels just as fresh and fun today as it did all those years ago. Graphically, the Mode 7 effects have obviously lost some of their edge when viewed today but the visuals are colourful and vibrant (if a little flat). The gameplay is as outstanding as ever, offering up a perfect balance of pick-up-and-play accessibility and sheer depth. Though F-Zero lacks a two player mode, its selection of 15 different tracks and its adjustable difficulty modes still give it a lot of lasting appeal. Like any classic game, F-Zero still plays great all these years later. F-Zero features four different racing hovercraft to choose from, each of which handles about as differently as it looks. Controls are simple; all you need to do is accelerate, and you can also lean left or right to make tighter turns or to drift slightly to either side. The handling and collision feel just right, and the sense of speed is terrific, as the game runs fast and smooth. You earn a speed boost after every lap, and you may also drive through an energy field to recover from damage you sustained while racing. You take damage from bumping into walls or other hazards and may even lose the race instantly if you fly off the track. Overall the presentation is remarkable. The music is uniformally excellent throughout — in fact, this game features some of the most impressive tunes you're likely to experience on a 16-bit machine. 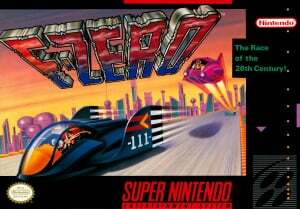 F-Zero qualifies as one of the greatest racing games available on the SNES and as a result is a highly recommended Wii download. Why does this game get 9/10, the same score as F-Zero X, when everybody seems to agree that F-Zero X is better? Which game is better F-Zero or F-Zero X? Surely it is possible to split them, especially now you're scoring games out of ten. There is no comparison; this game is nothing when stacked up against F-Zero X. That's all there is. Thanks Shinnock. I just can't understand why its 9/10 when it's a racing game with no multiplayer and appears to be superseded by F Zero X in every way. At the time I might of been impressed by the 'mode 7' graphics, but now I don't think thats relevant. I wouldn't compare scores between SNES games and N64 games. But yeah, this really doesn't deserve a 9. Its way too basic and completely lacking in standard options for it to be a 9. It may have deserved that score when it was first released but no way can it compare to the racing games that have been released since then on the super nintendo. Love that soundtrack! This is absolutely brilliant - though F-Zero X is superior. Still, both are certainly worth downloading. I am still torn between this game and F-Zero X. Both are outstanding games which I go back to often. In the SNES original the tracks are much tighter and there are some great Mode7 rotation effects on 180 degree bends. The tracks and varied and challenging and the handling is perfect. I just can't find much to fault with this game, it's just quality. Yeah 9 out of 10 is too much. I give it a 7. Still a great game. I'm sorry but I disagree with most of you guys on this one. This is as much a 9 game as any I have seen on SNES. You don't just mark a game down because it doesn't have some of the features that later games on SNES or games in the series had. You mark it on it's own merits and every single aspect of this game is completely solid, highly polished and a load of fun. The graphics for the time were stunning and are still kinda cool today and the game is silky smooth. The controls are perfect. The courses are brilliant and loads of fun to master. The music is excellent and still catchy to this day. The difficulty curve is great and the general gameplay is really well balanced and loads of fun. The whole package is just really finely tuned. It's as good a racing game on the system as any imo and I still think it is one of the most enjoyable pure racing games to play even to this day. If that isn't the basis for a 9/10 then really nothing is? So far, I rate this game a 7/10 just by looking at it, and F-Zero X a 9.5/10. Hopefully this game will surpass that. I still think F-Zero plays better than the rest of the games in the series and it still looks fantastic to me. A brilliant game, I can't wait to see it on the Wii U Virtual Console. I believe it arrives on 21st February 2013! F-Zero X is just great, this one is just... older. But I can't wait for the first time 60Hz version we are getting for 30 cents! I still enjoy F-Zero GX and its great production values but it's way too difficult compared to F-Zero X (the most balanced of the three).